Slotastic has unleashed its cutest, cuddliest game ever! The new Purrfect Pets slot has playful kittens and puppies – and bonus features like Doggy Dollars and Wild Cat Free Spins. Slotastic, which specializes in online slots, will give you 50 free spins if you've made a recent deposit. Then they'll give you another 44 free spins when you make another deposit. 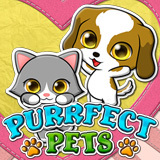 Charming cartoon puppies and kittens spin on the reels of the new high resolution, wide screen game. It has several bonus features where Kitties and Puppies trigger free spins where Scatters turn to Wilds and wins are multiplied up to 6X. Slotastic giving up to 94 free spins on cuddly new slot game until May 31, 2017. Puppy Scatter symbols can trigger 10 free Doggy Dollars spins. Scatters are additional Wilds during free spins and Kitten and Puppy Scatters can trigger more free spins. Three or more Wilds also launches 10 free spins. Prizes are tripled if there’s a Wild Cat in a winning combination. The Cats vs Dogs bonus feature begins after any spin that doesn’t trigger any other bonus feature. You pick a Purrfect Pet to reveal a prize that could be a Random Riches feature that multiplies wins up to 6X. Until the end of May, you can can take 50 free spins on the new game. Deposits (up to $444) will be doubled and include more free spins. All players that have made a deposit in May are eligible. Bonuses are valid until May 31, 2017 only. Slotastic has hundreds of casino games from Realtime Gaming. You'll find Purrfect Pets in its instant play online games and in its downloaded casino software as well as its mobile casino which was recently upgraded for optimal display on smartphones and tablets. Cash Bandits 2, a sequel to RTG’s popular bank robber slot, will be the next new slot game at the popular online casino.